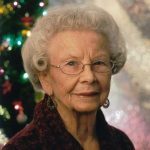 Betty Jo Hughes, 95, of Granbury died Jan. 27, 2019 at her home. Funeral: 2 p.m. Sunday, February 3, 2019 at the First Baptist Church Bedwell Chapel in Granbury. Interment: Holly Hills Memorial Park. Visitation: 7 to 8 p.m., Saturday, February 2, 2019, Wiley Funeral Home, Granbury. Mrs. Hughes was born Oct 14, 1923, in Rockwall to Loren E. and Lily R. Brunner. She married Jack W. Hughes on Dec. 4, 1948, in Lancaster. She worked for both the U.S. Treasury Department and the Bureau of Reclamation. Mrs. Hughes was a member of the First Baptist Church of Granbury, and was a resident of Granbury for 43 years. Survivors: Sons, Jack L. of Denver, Colo., Paul L. and wife, Connie, of Denver, Colo., Gary W. and wife, Debra, of Salinas, Calif., five grandchildren; and eight great-grandchildren.